to improve the understanding of normal brain functioning and its failure in disease. A central goal is to translate these insights towards clinical application to develop predictive diagnostics for refined treatments. Sleep is essential for daytime functioning and well being. Without sleep optimal brain functioning such as responsiveness to stimuli, information processing, or learning is impaired. The neuronal correlates underlying the decline in cognitive performance, however, have been difficult to identify. This shortcoming may be a result of an insufficient understanding of what determines and constitutes even normal cortical functioning and information processing. Although a generally accepted framework of how brain networks process information in optimal ways is still missing, there has been considerable success in approaching some of the brain’s functions from a physics perspective. The relevance of such a dynamical system framework for brain functioning goes back to the 1950s when Alan Turing suggested it as a way the nervous system is afforded the speed and flexibility required for instantaneous reaction to novelty. Since this time it has been a recurrent idea that brain networks might operate near some bifurcation or critical points for flexible switching between coherent states, which, more generally, has been argued to bring about optimal computational capabilities. We recently proposed that this dynamical system framework might also be useful in identifying the neuronal underpinnings of cognitive deficits in the course of extended wakefulness. In several studies involving human EEG and ECoG as well as rodents, we could show that the signatures of critical dynamics progressively fade during sustained wakefulness. 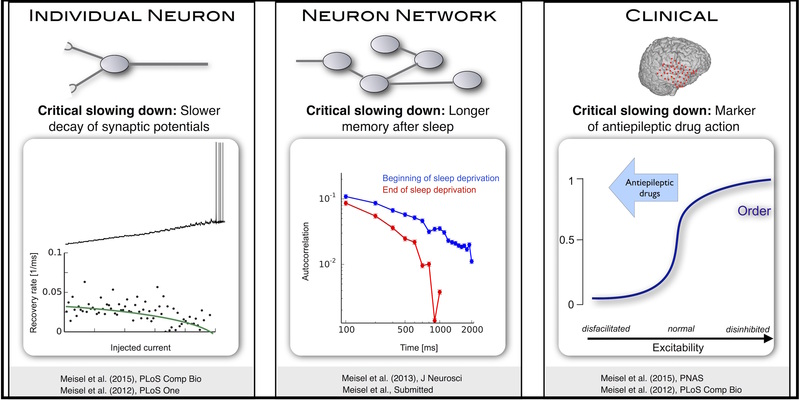 These results point to a network-level function of sleep: to reorganize cortical networks towards a critical state to ensure optimal function for the time awake. Many complex systems have been found to exhibit critical transitions, or so-called tipping points, which are sudden changes to a qualitatively different system state. These changes can profoundly impact the functioning of a system ranging from controlled state switching to a catastrophic break-down; signals that predict critical transitions are therefore highly desirable. To this end, research efforts have focused on utilizing qualitative changes in markers related to a system’s tendency to recover more slowly from a perturbation the closer it gets to the transition — a phenomenon called critical slowing down. The recently studied scaling of critical slowing down offers a refined path to understand critical transitions: to identify the transition mechanism and improve transition prediction using scaling laws. We recently outlined and applied this strategy for the first time in a real-world system by studying the transition to spiking in neurons of the mammalian cortex as well as the onset of epileptic seizures in model system. We could show that these scaling laws allow for the identification of the underlying bifurcation and that they can be used to predict the bifurcation point from a limited window of observation. As such, the scaling laws present a missing link for a broad class of neuroscience modeling and suggest improved estimation of tipping points by incorporating scaling laws of critical slowing down as a strategy applicable to other complex systems.